Update: As we suspected this video was is no way sanctioned to be released publicly and as such, a copyright claim by AOL/Engadget has had it removed. Translation: this was suppose to be under wraps but was made public on accident. 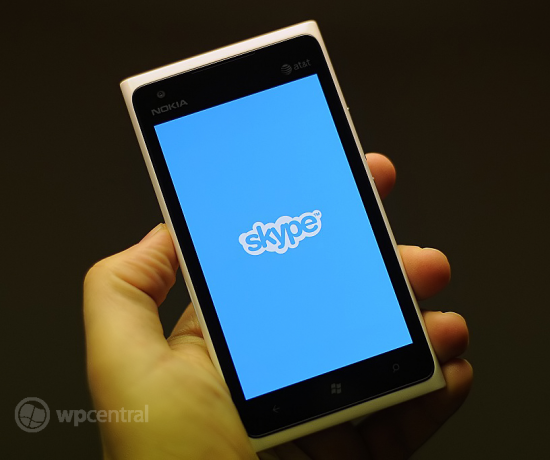 Skype for Windows Phone 8 has been demoed by Derrick Snyder, now head of mobile marketing at Skype. In the video, Snyder runs viewers through what we can all expect from the new client. Now, before we crack into what's shown in the video, it's worth noting that this is a brand new application for Windows Phone, though many of the new features have been covered before. Snyder states that it has been completely rewritten from the ground up in native code, with presumably further access granted by Microsoft since the takeover. Featuring a new UI, Skype for Windows Phone 8 will enable users to get to contacts faster and engage in conversation more conveniently. The first new addition one will notice is the support for Live Tiles (available in all three sizes - large tile includes latest message received). So, as this is a new app that has been developed by the team to take advantage of the next version of Microsoft's mobile operating system, it will run in the background. That's right people, Skype will not have to be running in the foreground for calls and messages to be received. 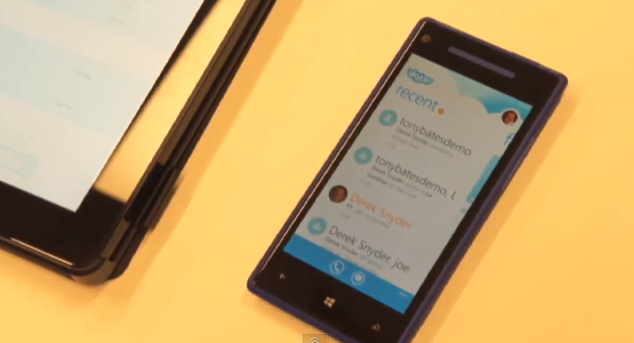 According to Snyder, when you boot up the device Skype will then be able to receive calls / messages from contacts. Speaking of calls, any incoming voice chat requests from contacts will be displayed as normal calls that we're used to with Windows Phone. Contact's display photo will be displayed with the usual accept and reject options. The only difference is the Skype ringtone will sound, so you'll know whether it's Skype or an actual call via the network. Another fairly large implementation is the included integration into Windows Phone itself. Skype is now a service that can be configured much like Facebook, Twitter, Microsoft Account and more. The service will appear in the People Hub where conversations and Skype calls can be initiated in contact profiles. What's more is Skype will automatically pull contact information from the People Hub and display the listing within the app. Group chat in the new Skype app is straightforward and easy to use. Adding contacts into an already populating conversation and adding a topic title for the group chat is just a few menu options away. As well as group chat, Snyder also quickly looked over favourites, which can be configured with contacts loaded in the app. It's a fairly large improvement over what we're currently sporting on Windows Phone 7.5, and we're sure you're all eagerly awaiting its release (we guess will be some time after Apollo's release). Our Rafael Rivera wrote up a masterpiece on why Skype is in its current state, which is well worth checking out. Be sure to check out the video below for a visual walkthrough of what we've noted in this article.